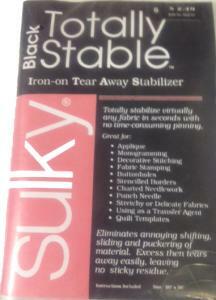 Sulky Totally Stable stabilizer is a temporary, iron-on, tear-away stabilizer that is perfect for knits and stretchy fabrics. It totally stabilizes in seconds with no time-consuming pinning. Eliminates shifting, sliding and puckering, then tears away easily, leaving no sticky residue. All Sulky stabilizers are acid and lead free. Our packaged size stabilizers are great for trying out or for smaller projects. Totally stabilize virtuallly any fabric in seconds with no time-consuming pinning. Because all Sulky Tear-Away Stabilizers are made from non-woven materials they don’t stretch in any direction. Totally Stable can be peeled up and repositioned many times, making it perfect for Appliqué, Stenciled Borders, and making precision shapes for quilting. Use Totally Stable as a foundation to make a perfect strip-pieced Chevron Quilt Border; start with a triangle at the angle you wish, then sew, flip, and iron down each strip. Sulky 751-01 Tear Easy Soft Lightweight TearAway Stabilizer Sheet 36x20"